The western pond turtle is uncommon to common in suitable aquatic habitat throughout California, west of the Sierra-Cascade crest and absent from desert regions, except in the Mojave Desert along the Mojave River and its tributaries. Elevation range extends from near sea level to 1430 m (4690 ft) (Jennings and Hayes 1994). Associated with permanent or nearly permanent water in a wide variety of habitat types. Feeding: This species is considered omnivorous. Aquatic plant material, including pond lilies, beetles and a variety of aquatic invertebrates as well as fishes, frogs, and even carrion have been reported among their food (Stebbins 1972, Nussbaum et al. 1983). Cover: Pond turtles require basking sites such as partially submerged logs, rocks, mats of floating vegetation, or open mud banks. Turtles slip from basking sites to underwater retreats at the approach of humans or potential predators. Hibernation in colder areas is passed underwater in bottom mud. Reproduction: Storer (1930) suggested that two distinct habitats may be used for oviposition. Along large slow-moving streams, eggs are deposited in nests constructed in sandy banks. Along foothill streams, females may climb hillsides, sometimes moving considerable distances to find a suitable nest site. Nussbaum et al. (1983) reports a nest in a clover field 100 m (325 ft) from water. Nests have been observed in many soil types from sandy to very hard. Soil must usually be at least 10 cm (4 in) deep for nesting. Nests must have a relatively high internal humidity for eggs to develop and hatch properly. Water: Individuals normally associate with permanent ponds, lakes, streams, irrigation ditches or permanent pools along intermittant streams. Hatchlings may be subject to rapid death by desiccation if exposed to hot, dry conditions. Pattern: Associated with permanent or nearly permanent water in a wide variety of habitats. Activity Patterns: Most activity is diurnal but some crepuscular and nocturnal activity has been observed. Individuals are active all year where climates are warm but hibernate during cold periods elsewhere. Seasonal Movements/Migration: During the spring or early summer, females move overland for up to 100 m (325 ft) to find suitable sites for egg-laying. Other long distance movements may be in response to drying of local bodies of water or other factors. Home Range: The home range is normally quite restricted (Bury 1970, 1972) except for occasional long distance movements as described above. 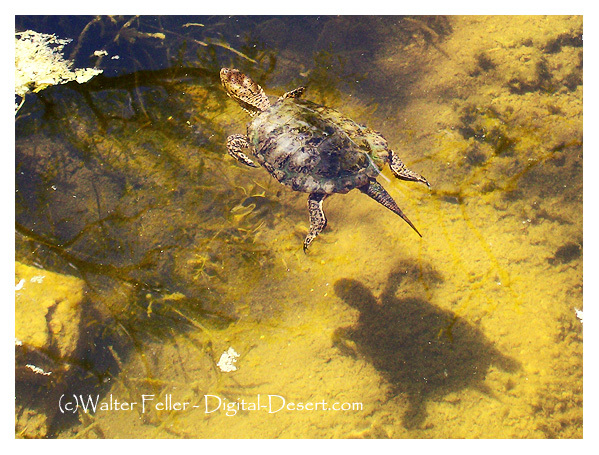 Territory: The western pond turtle is not known to be territorial, but aggressive encounters including gesturing and physical combat (Bury and Wolfheim 1973) are common and may function to maintain spacing on basking sites and to settle disputes over preferred spots. Reproduction: Three to 11 eggs (Ernst and Barbour 1972) are laid from March to August depending on local conditions. The incubation period for eggs maintained in the laboratory at 30° C (Feldman 1982) ranged from 73 to 80 days. Sexual maturity is thought to be attained in about eight years. Niche: This is the only abundant native turtle in California. Hatchlings and juveniles are preyed upon by a variety of vertebrate predators including certain fishes, bullfrogs, garter snakes, wading birds, and some mammals. Competitive interactions with other species have not been reported. Northwest. Univ. Press of Idaho. 332pp. Stebbins, R. C. 1972. California amphibians and reptiles. Univ. California Press, Berkeley. 152pp. Storer, T. I. 1930. Notes on the range and life-history of the Pacific fresh-water turtle, Clemmys marmorata. Univ. Calif. Publ. Zool. 32:429-441.